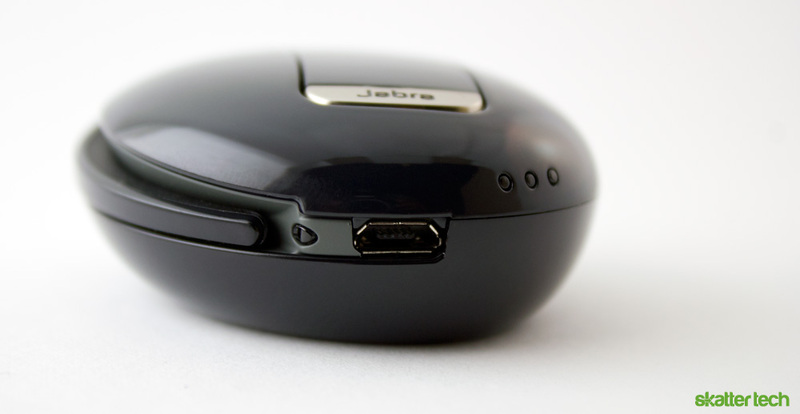 About a week ago, I finally got my hands on the second-generation Jabra Stone2. Like the original, the new model features a futuristic design that sets it apart from traditional Bluetooth headsets. Only a few other headsets including the Jawbone Icon fall into this exclusive category. At a fairly high price point, the Stone2 is a premium Jabra accessory for those looking for a stylish hands free experience. 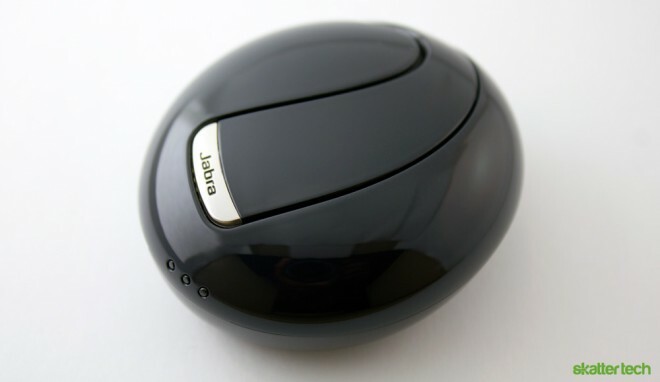 Unlike its predecessor, it also brings support for voice activated actions. Jabra makes pairing the Stone2 a hassle free. When pulled out of the charging base, the headset begins speaking to the user. This is better than having to scramble around with the manual to decoding the meaning of random patterns of flashing lights. The dictated walk-through even provides important details such as the pairing code if your device requires one. I managed to pair the Stone2 with the Android-based HTC EVO 4G and Motorola Xoom easily. I found that it can simultaneously stay connected to multiple devices at once. I ended up leaving it connect to my Windows 7 machine for wireless Skype calls and to my smart phone as well. This makes it easy to switch back and forth between devices on the fly without having to re-pair each time. As someone who struggles to find ear bud headphones or headsets that stay put, I can say the Stone2 fit my ear well. Unfortunately, the headset did not fit the ears of at least three other people I had try it on. The headset is a single solid piece of plastic with minimal flex. There are no adjustable or rotating parts to accommodate different ear sizes. Although Jabra bundles a total of four ear tips, finding a comfortable and secure fit is either a hit or miss. Then there is also another problem: it is only for the right ear. Unlike most headsets that can flip to work with either the left or right ear, the Stone 2 only offers a single choice. This definitely will not suit those who like switching things up or those that may prefer the left side. As for the design, there is nothing more than a single button on the outward facing front. There is no power button, dropping it into the base turns it off. Volume controls are also missing, but your device can still control levels through software. A single click answers an incoming call or ends an in-progress conversation. A single tab during standby reads out the remaining battery life, which is a nice touch. A second long press initiates your device’s voice command feature. Update 3/16/2011: The Stone2 ear piece has a subtle capacitive touch control which lets users increase or decrease volume by running their finger from the top to the bottom or vice versa. I placed a few phone calls from various environments to test the audio quality. These included a silent room, a car on the highway, and in the lobby of a noisy restaurant. The experience went from decent to worse, respectively. Although the headset features dual microphones for noise cancellation, it was barely effective when combating external sounds. While this worked well in quiet places, people on the other end can easily tell when you are driving a car. It was actually difficult for the listener on the other end to even make out what I was saying even when restaurant sounds were not too challenging for my built-in cell phone microphone. People often said I sounded too quite or distorted even when my phone had enough signal. I also found that it was hard to hear the person on the other end even if I turned the volume up at times. I have had significantly better experiences with the Jawbone Icon and older Jabra products. For those wondering, I was only getting about two hours of battery life. This is less than ideal for those who intend to use this throughout an entire day. The base unit packs an internal battery for three full re-charges without having to find a power outlet. This is a neat feature, but it still means having to switch back to your phone for 20 minutes until the headset is replenished. The Stone2 base features a standard microUSB port. 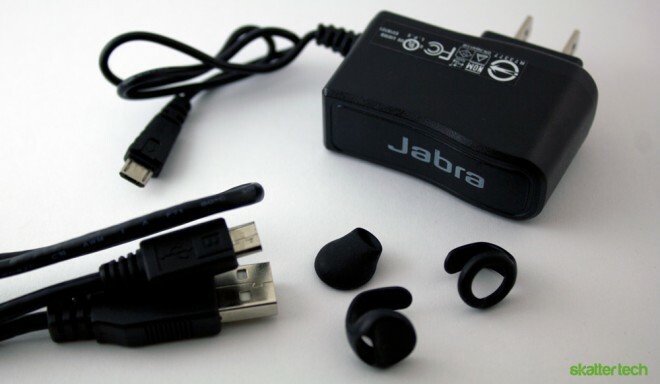 Jabra includes both an AC wall adapter and a USB cable in the packaging, which is definitely appreciated. Unfortunately, I quickly realized that you can not charge the headset without the charging base, which is a problem if it gets lost. Another feature worth noting are the built-in voice commands. When your device begins ringing, the headset reads out the number to you. It is a fancy touch, but it does not read out names and it will not help if you do not have people’s numbers memorized. I also loved that you can simply say “answer” or “ignore” rather than having to press a button on your headset or fiddle with your device. While I’m generally a fan of Jabra Bluetooth headsets, this one is beyond difficult to recommend. I was excited for the unique design and the fancy charging base station, but there are many critical issues. Despite the easy configuration process, the device lacks flexibility to fit differently sized ears, the battery life is not ideal, and the audio quality is not entirely acceptable. For those still interested, Jabra offers a glossy version of the Stone2 for AT&T customers and leather version for Verizon Wireless. The suggest retail price is $129, which is a way too expensive for a headset with so many problems in my opinion. I should note that retailers such as Amazon offer it for as little as $90. For the most part, I would suggest searching for alternatives unless you absolutely adore the design and make a minimal number of calls from quite areas. I can’t believe I missed that. Thanks for pointing that out. I’m updating the article with the corrections. You can run your finger from the top to the bottom of the ear piece or vice versa to gradually decrease or increase volume. It’s actually a very subtle and neat design. The device works well for me. I always make calls from different environments and i dont have any problem with audio quality. The person im calling can hear me clearly even if i was calling in a windy environment , a busy restaurant or a car with windows open. My only gauge that it works well is if i will have the same kind of audio quality if i was using only my phone unit. And it does. I paired it with an iphone4 by the way. I would not recommend this product for use with the iPhone 4s.This product does not work well when using Siri. After verbal commands to Siri, the headset will respond with “call ended”. When in fact, no call was placed. Brought this to the attention of Jabra customer service. Their response was “For further assistance you will need to contact app manufacturer or Apple directly”. Jabra did not seem interested in fixing the problem, which should only require a simple software update. The battery life is about 2 hours. The earpiece does have a comfortable fit.